Never heard of this car before? That’s okay, neither have I. But that’s because it’s a one-off special – not a car that ever entered series production. In fact, this car is made up of parts from many other cars – a number thought to be as high as 27! The DRA (Doherty Racing Automobile) was built in 1937 by W.T. Doherty, a garage owner in Ireland. He built it to race in the 1938 Limerick Grand Prix. where he finished 8th, which happened to be a DNF. 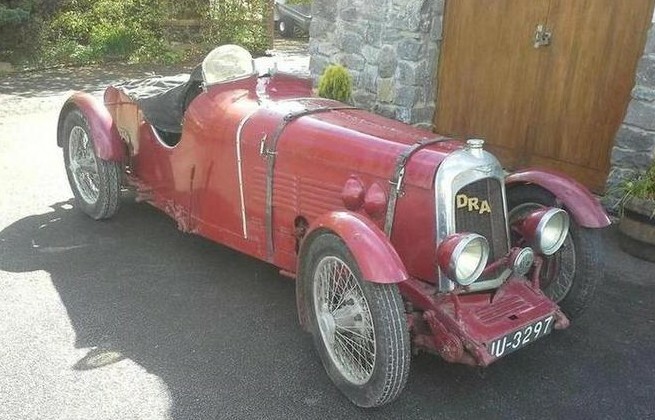 It also competed in the 1938 Irish Motor Racing Rally, where Doherty ended up 4th. This special is built around a Riley Nine, but has bits and pieces from a bunch of other cars. The engine is a 1.1-liter straight-four making 9 horsepower. Mr. Doherty sold the car in 1945 and the current owner’s family acquired it in 1966. The restoration was completed in 1967 and the car has been parked for quite a while – meaning it will need freshening in order to be used. Still, this is a one-of-a-kind car that can be yours for between $59,000-$67,000. Click here for more info and here for more from Bonhams in Oxford. This entry was posted in Uncategorized and tagged 1937, 9hp, auctions, Bonhams, cars, classic cars, dra, special by classiccarweekly. Bookmark the permalink.